One of the key topics that was covered this week that I think would benefit others from discovering is the difference between the FOCUSED mode of thinking and the DIFFUSED mode of thinking. DIFFUSED MODE is a more relaxed thinking state, one the the brain settles into at resting. If you image the brain like a pinball machine, focused thinking would be your standard difficulty machine with nobs tightly packed and your thoughts bouncing off of those nobs randomly and rapidly. Only through practice do those random paths become ingrained. (The nobs are likened to neurons and neural synapses the pinball) In diffused mode the pinball game is an easier version, the nobs are more widely spaced and the thoughts are freer to take there own path. Another way of imagining it that made a little more sense than the pinball analogy was the FLASHLIGHT ANALOGY. This involves visualizing your brain as a flashlight; Diffused mode of thinking could be thought of as a setting on the flashlight designed to cast a broad light not very strongly, while focused mode would cast a very strong light in smaller area. You cannot use both modes of thought at once. Its best practice to toggle between focused and diffused mode. Its pretty self explanatory how to use our focused modes of thinking, but how do we tap into the relax state of the diffused mode and use that for learning???? Lets look at one of the foremost surrealist painters of the 20th century, Salvador Dali. 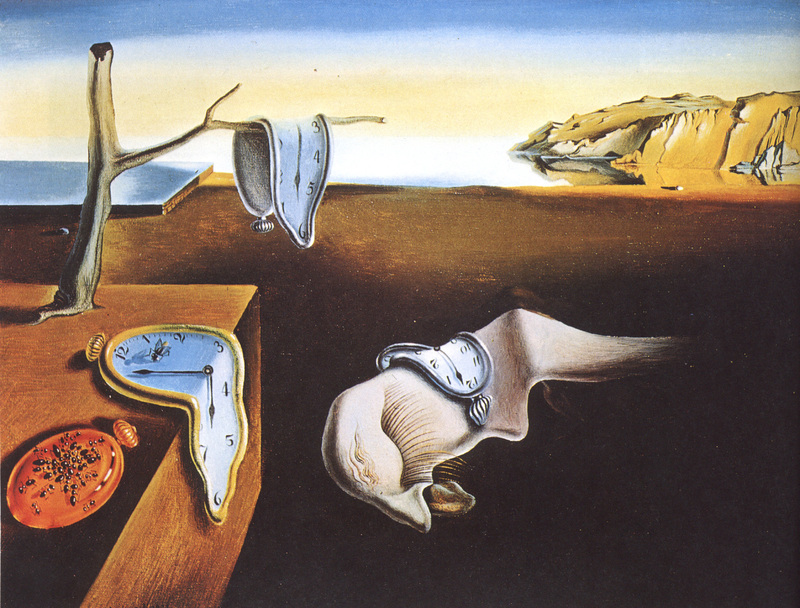 Seen above is Salvador Dali and one of his most well known paintings called ironically enough for this lesson, “The Persistence of Memory.” Painted in 1931, “The Persistence of Memory” was a work of surrealism. Surrealist painters considered their artwork to be reminiscent to a dream. Dali’s self described descriptions of his work was as, “Hand painted dream photography.” I’ll save the complicated analysis of this painting for my Art History class but for our purposes lets just say Dali was considered very creative and very free thinking…sound familiar??? Salvador Dali was said to relax and drift off to sleep with a key dangling and upon his dozing off to sleep he would drop the key, it would jangle and startle him awake. This is an example of Dali bouncing between thought modes. He would clear his head and relax his mind until sleep came, entering the diffuse mode, then he would wake up and drag all those wonderful diffuse mode ideas back the focused mode and the results were brilliant works like the painting above. Thomas Edison also used a similar approach to travel between thought processes. Thinking about something prior to sleeping or napping will give you a better chance of DREAMING about that thing. Dreaming about it will help you to retain whatever it is that your studying. EXERCISE is a wonderful way to gain entry into the diffused mode of thinking. It is also beneficially in numerous way apart from the physically obvious ones. Those benefits include the generation of new neural pathways in the brain. Pinball machine, image © Kevin Mendez, 2014. 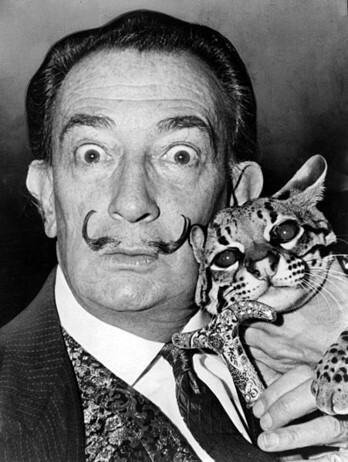 Salvador Dalí with ocelot and cane, 1965; http://en.wikipedia.org/wiki/ File:Salvador_Dali_NYWTS.jpg From the Library of Congress. New York World- Telegram & Sun collection. http://hdl.loc.gov/loc.pnp/cph.3c14985; Author: Roger Higgins, World Telegram staff photographer; no copyright restriction known. Staff photographer reproduction rights transferred to Library of Congress through Instrument of Gift. Pingback: [INTP] How to turn off the logic for a moment and be more creative?